Opening up in Lana's Sanctuary, Lois finds Lana's Superman scrapbook. Lana begins to ask Lois about Clark, which initially makes Lois uncomfortable. Lois tells Lana about the radiation ordeal that Lex put her and Clark through, but reminds her that they "made it work". Lana moves on and offers Lois some stew that one of the kids whipped-up before talking about what her new mission in life is to which Lois responds in wanting to hug Lana, who declines. Just then, there's noise outside that infers trouble and Lana super-speeds out, only to be attacked by John Corben aka Metallo! Lana gets taken to the ground, but immediately reacts and kicks Corben in the face. Lois runs outside and exchanges a sentence or two with Corben before explaining to Lana that Metallo was once a man who was experimented on by Zod's Kandorian scientists, who turned him into a Kryptonite powered cyborg. Corben brings up that Lois had given him a Red Kryptonite powered heart, but it didn't work as well as the Green. Corben continues to explain that when he worked for Toyman's Marionette Ventures, he was excited about his gig. Although he never fought Supergirl, he was given a new Green Kryptonite heart, which can absorb Meteor Rock aka Kryptonite. With her suit in danger of being absorbed, Lana lunges at Corben to defend Lois and the children, but then put in a choke-hold by him as he starts to absorb her Kryptonite laced nanites. Lana, shoved to the ground, is lifted up by Lois as they watch the Kryptonite nanites reform and upgrade Corben's body into a new and improved version of Metallo! Story - 4: Guys, I really liked this chapter! Yes, I'm being completely serious here, I really liked it. The beginning conversations between Lois and Lana were actually really good, and I really enjoyed the awkwardness that was going on between the two. 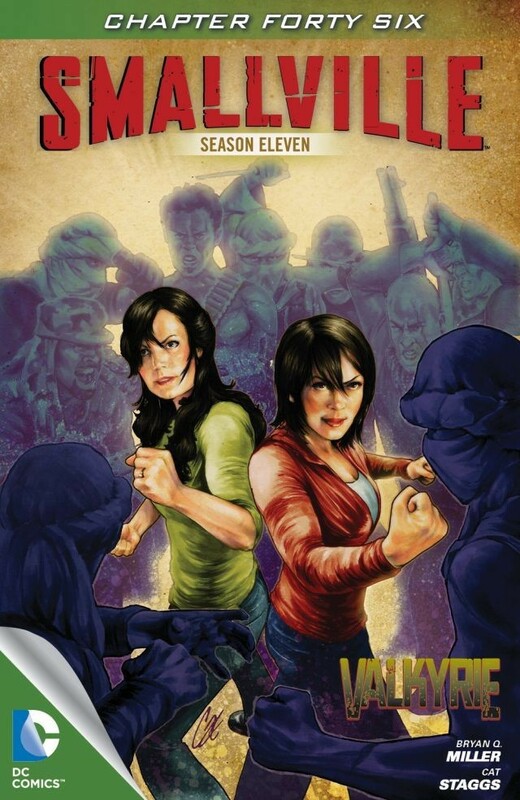 Just yesterday, I bought the graphic novel version of "Guardian," the first episode of Smallville: Season 11, and I was reminded of exactly where we were at the start of this series. Now that we're on episode 6 ("Valkyrie" is considered episode 6, "Argo" is episode 5), I see the changes in Lois. Lois is much surer of her life than she was even in "Guardian" believe it or not. And yes, she was a little uncomfortable talking to Lana about Clark, as she should be, but she definitely has this new-found confidence that everything will work out, something she had throughout Season 10 of Smallville until "Prophecy". Speaking of "Prophecy," I really enjoyed all of the Corben backstory that I was so glad we got. While the Season 9 episode "Metallo" was done very well, "Upgrade" didn't really wrap-up the character as it probably should have, especially with his cameo in "Prophecy". I guess it actually makes sense that the Red Kryptonite wouldn't work in Smallville's Metallo's body. The reason being that the Kandorian's barely made him functional at all with the Green Kryptonite in the first place; adding another color into that "heart matrix" would probably not work, and even if it did, it would have different effects as it would on Clark, Kara, Zod, etc. And just to clarify, I'm not saying that Corben would be affected by straight-up Red K, that's not what I'm saying at all. He wouldn't be because he's human and not Kryptonian. However, I am saying that the tech used to create Metallo in the first place may not have been compatible with the Red Meteor Rock as it was with the Green. Anyway, I predicted last week that Corben would (hopefully) take Lana's K-induced nanites away, leaving her powerless... I was right, and I'm happy about it. As much as I actually liked the idea of the Angel of the Plateau originally, I still believe that Lana's destiny doesn't involve her having powers. Ever since "Legion" when Saturn Girl told Lana that her destiny would be different from Clark's and one of her own, I knew that there was no way she would be able to have super-powers, because it had to be her own. One of the things about normal comics-continuity Lana is that she is still friends with Clark and Lois and visits from time-to-time. This is something that I wanted to see them do on Smallville, or at least Season 11. Again, Smallville's Lana is totally different from the Lana Lang that many comic fans know and love, which is neither good nor bad, it's just different. I will say this though, because I don't want to harp on this topic for too long, I never believed that Smallville's Lana deserved powers. Every time she had powers she abused them, especially in Season 7's "Wrath," and I always felt it was a cop-out how they got rid of her in "Requiem". I felt that that character deserved a better ending and didn't need to be forcibly taken from Clark in order to realize that they weren't right for each other. My hope here is that if Lana's powers are gone for good that she will realize that Lois and Clark belong together. And who knows, maybe she'll fall in love with Pete Ross or this David Zavimbe (who in the New 52 is "Batwing" by the way) that she knows in Africa, and then realize her true purpose/destiny. I really hope so, because I really do want her to have a happy ending, but one that doesn't make her a "carbon copy" of Clark Kent. Bottom-line here is, I'm happy that her powers are gone. Finally, I really liked Metallo's "upgraded" form, and I'm really hoping that throughout Smallville: Season 11 that we will see Corben evolve into something more like his comics counterpart, in terms of look (I'm thinking Superman/Batman: Public Enemies here guys). Oh, and did anyone else find it a little out-of-character for Lois to want to hug Lana, especially after all the awkward Clark-talk that had just gone on? Anyone? Bueller? Anyway, I am really looking forward to seeing how Lois and Lana defeat Metallo when "Valkyrie" returns in chapter/issue 50 of Smallville: Season 11! Art - 4: As I talked about last week, I really like Cat Staggs' art. Between her Smallville covers to her interiors in "Valkyrie," she knows how to make a character look like his/her actor. I really loved how in each panel that we saw John Corben/Metallo, that he looked exactly like Brian Austin Green! That was very well done on Ms. Staggs' part. I also like the way that Lois is drawn like Erica Durance, that helps me hear the character's voice a lot clearer, let me tell you. My one complaint is that there are a few panels where I would not have been able to tell by the face that Lana is Smallville's Lana Lang/Kristin Kreuk. I mean, she gets it spot-on on the "Valkyrie" cover art, but at least in this issue's interior it was a little off. Didn't stop me from enjoying it, it was just something that I noticed.